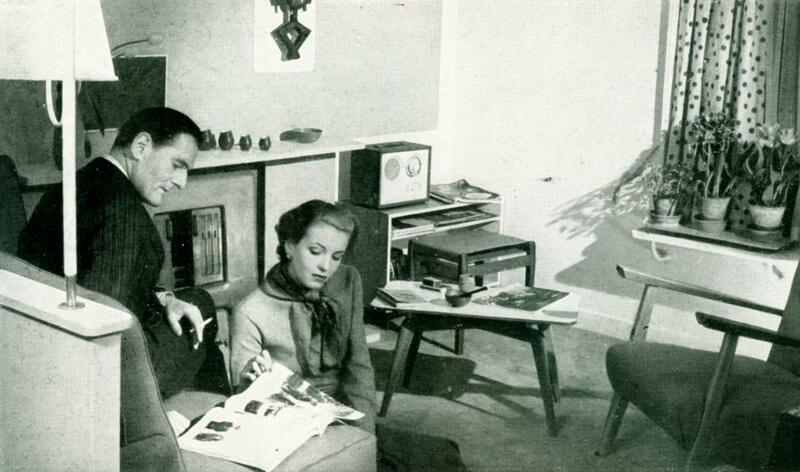 Yes, I agree the picture is not "typical" of the times but or an "ideal home" advert for modern living. Most people were still living with handed-down furniture and making-do. Our family would have been considered lower middle class I suppose as my father had recently secured a managerial post. In the mid 50's when i was about one year old, my parents managed to rent a house with two sitting rooms. They had no money to furnish the front room and it stayed completely empty for a number of years. Every Sunday their two arm chairs, a small square table and the mains table radio were moved into that room and after Sunday lunch and we spent the afternoon and evening in there. After I went to bed, the furniture and the "wirless" were moved back to the back room and we spent the rest of the week there. This was still going on when I was about seven and they got their first tv. That was moved into the front room on Sundays but they had managed to buy a there piece suite by then. We had a coal fire in one room only (front room on Sundays!) and the paraffin heater in the hall. It had to heat the hall, stairs bathroom and three bedrooms! Ice on the windows and no loft insulation. My bedside table was a wooden orange crate. One memorable event was the purchase of a single bar electric fire which went on the landing on really cold nights and in the bathroom with a long taped-up flex and a big two-pin plug (!!!!) on bath night to stop the icicles forming!